You can protect your oil line with a CSA approved Haseloh Fuel Oil Safety Valve™ and Tigerloop® deaerator, a system that protects your oil line from the oil tank to your oil pump. This in-tank safety valve is installed before the manual shut off valve. 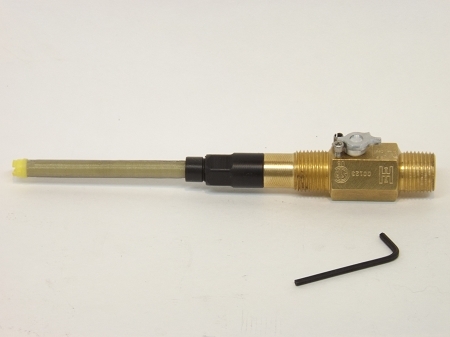 Should someone cut your oil line by accident (lawn mower) or intentionally (vandalism, theft) this patented safety valve immediately 'locks' the oil in your tank. B139 Series 15 code implementation took effect on March 8, 2018. Most tanks will now have the oil line installed in the top of the tank with a de-aerator. This will not prevent siphoning of oil should there be any breakage in the oil line, it's components or if there is a fuel pump failure below the liquid level of the tank. This anti-siphon valve will prevent oil from flooding your property if there is a breach in the oil line system. Most insurance policies carry a deductible that cost more than this valve. The Haseloh Fuel Oil Safety Valve™ is produced by the manufacturer of the Haseloh Pipeline Leak Detection System™ in Kindersley, Saskatchewan. Value Sales Ltd. has been serving the HRM community since 1958. If you have any questions, please call us at 902 468 1220 or come into our store. We are located at 723 Windmill Rd. in Dartmouth, Nova Scotia, CA. Copyright Value Sales Ltd.. All Rights Reserved. Shopping Cart Software powered by 3DCart.